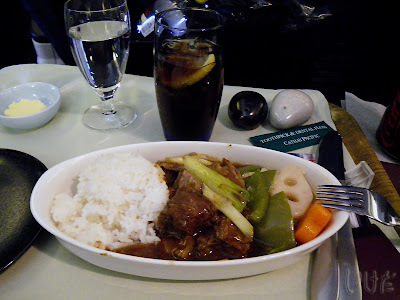 How is it that when flying economy on a major European (or American) airline, the food resembles something scraped off the floor of Shinjuku station right before the last train leaves the city? Granted, the scrapings are heated and covered in plastic wrap, but still look, taste and smell like something that was meant to be flushed down the toilet. And to top it all off, if you are served this something on your flight, you can consider yourself lucky. 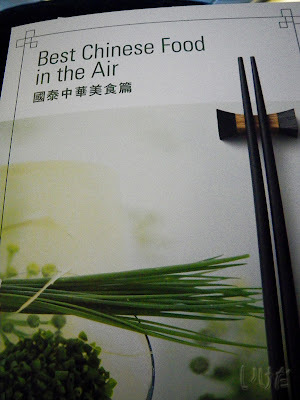 And how is it that when flying economy on a major Asian airline, the food at least tries to resemble food in shape, smell, form and quite often - even taste? 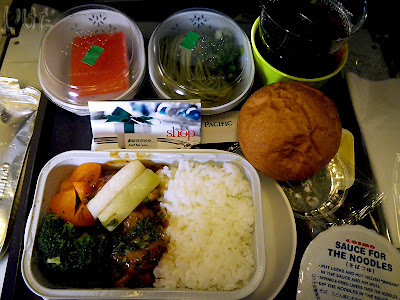 Though, my recent experiences on Cathay Pacific show that Asian airlines are doing their best to catch up with their European and American counterparts and level the playing field when it comes to in-flight meals. But even if the taste might be unappealing, they still strive to make their "chicken or fish" offerings look vaguely appealing. And that's just how it was during my flight from Narita to Hong Kong last December. Something was served, I poked it with my fork, it didn't poke me back. I picked at a few random bits and pieces of whatever it was supposed to be and then demanded another Diet Coke. Which I didn't get. I miss the days when you could get an entire can of soda with your meal or snack on the plane. Nah, no more... Now it's a lousy two-thirds filled plastic cup with a couple of huge ice cubes - probably so you get even less of the actual beverage you ordered. I bet it saves the airline billions of dollars in the long run. By the time we landed in Hong Kong, I was suffering from a miserable case of caffeine deficiency. I got me a bottle of Coke Light and waited for the next flight. When it was time to board, surprise surprise, the boarding pass issued at Narita for the connecting flight was angrily spat out by the gate computer thingy. What's wrong? Nothing. I was upgraded to business class and Cathay Pacific forgot to tell me. Lucky me. And that's how a totally uncouth country hick got to fly biz class on an international flight. Fancy drinks were served before the takeoff. I asked the lady for Diet Coke. She gave me a dirty look and offered wine. Since I didn't know how to use the in-flight entertainment system and was too embarrassed to ask (hey, gimmie a break, they don't have such posh gadgets in the back of the bus, OK? ), I took a nap instead. While I slept, a menu mysteriously appeared in my lap. Someone, or something, also managed to wrap a blanket around me and stick a pillow under my head. But still no Diet Coke. 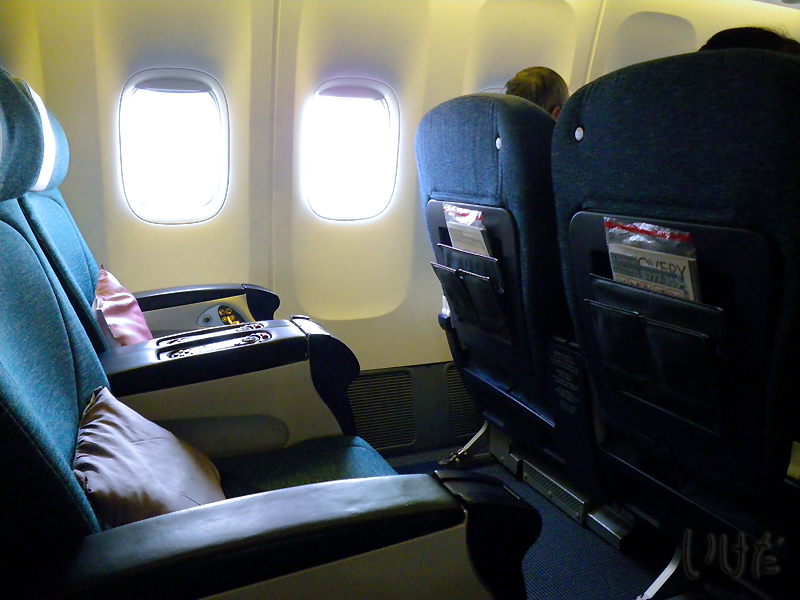 I pressed the buzzer and a second later a flight attendant materialized by my seat. I'd like a Diet Coke, pretty please? But of course, says she. 10 seconds later she materializes again with a tiny glass cup (no plastic here in the posh section) filled two-thirds with my favorite beverage of choice. And yes, you guessed it, there were two ginormous ice cubes in it, too. I drank it in one gulp and asked her for a whole can, or a bottle. She gave me a dirty look and vanished. I didn't see her again until it was chow time. The usual trappings of a fancy French restaurant were all very visible here, too. Big plates with miniscule amounts of pretty looking items, which may or may not be edible. I ate the garlic bread and the green and red stuff (no shrimp though) and realized I was hungry. Very, very hungry. But not hungry enough to consume shrimp, apparently. I asked for more garlic bread and got a dirty look instead. Still no Diet Coke. The main course was served. This dish was OK, sweet and not spicy, but perfectly edible. I still had a blob of butter left from the previous course, but no additional bread was offered this time. But I got my glass filled with Diet Coke. Finally. All 250 ml of it. I finished it in two big gulps and when the drink cart appeared again, I was offered 6 types of wine, 20 varieties of beer, countless booze, but when I asked for a whole can of Diet Coke, all I got was another dirty look. The cart rolled away, I got up and pretended to go to the toilet. I stopped in the galley, and lo and behold, right there on the counter was a six pack of ice cold Diet Coke. I took one can and went back to my seat. Self-freaking-service in business class? 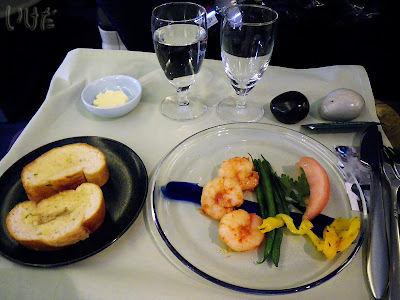 The times have surely changed since the last time I flew first class (well, in my defense, it was about 20 years ago). I drank my Coke and went back to sleep. And used every inch of available leg room.